The next time you accidentally spill soda, or water, plus a little baking soda on one of your cutting boards, don’t complain about having to clean it up. Instead, tear the safety cover off your microwave and use it as a high-voltage power source to etch a cool lightning pattern into the mess. The patterns that result are called Lichtenberg figures, named after German physicist Georg Christoph Lichtenberg, and are created in a similar fashion to how lightning streaks across the sky during a storm. 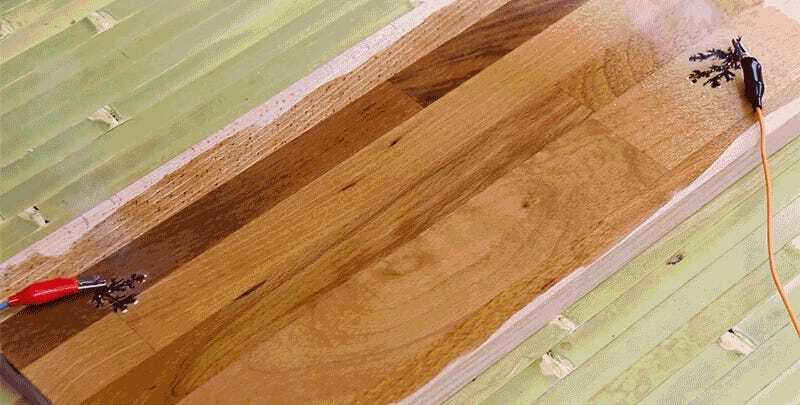 In this case, the branching patterns emerge as an electrically-conductive baking soda solution, brushed onto the piece of wood, is being scorched by a high voltage source. As the branches form, heat is produced which dries out nearby surfaces, causing the paths to continuously change direction towards more of the conductive solution. 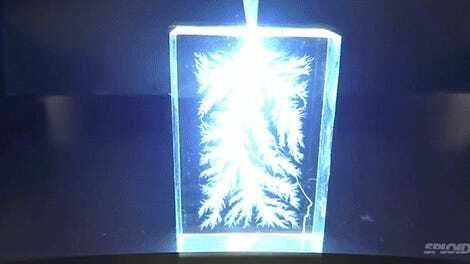 It’s a fascinating experiment, which you really shouldn’t ever try at home because you’ll need several thousand volts to create Lichtenberg figures. Few devices in your home can generate that much power, except for your microwave which you really shouldn’t be cracking open—even for science.